Central Provisions was recently nominated for a James Beard award. With that in mind, my wife and I headed to the Fore St. eatery early for what we hoped would be a fantastic meal. If you want to eat dinner there on the weekend and don’t want to wait two hours, plan on being in line outside about 10 minutes prior to their opening. The restaurant is very small and popular and has a bar downstairs where people sit and drink and then get in a separate indoor line for when the restaurant opens. Add that to the fact that Central Provisions doesn’t take reservations and you’ve got yourself a place that can give you a significant wait. While it’s somewhat usual for a place of Cent Provs reputation not to take reservations, it works out pretty well; they don’t have to wait for people who turn out to be a no-show and customers never have to either. If you’re there and there’s a seat available, you get seated. Once you’re seated, you’ll never feel rushed because they recommend you order one plate per person at a time – they’re meant to be shared – until you get about three plates each. Plates simply come out as they’re ready and you feast as long as you continue to order. We sat at the bar per our request. Because it surrounded the kitchen, we had a close-up, direct view of the food preparation. With drink and a food menus in hand, I put my menu-reading eyes on and searched for my prize. Starting with the beverage list, I considered wisely what would suit my fancy. I didn’t have a lead on what I wanted, but I perused the entire menu to determine what would give me that oh-so-fresh feeling. After much contemplation, I decided to go with the Cobbler – whiskey, amontillado sherry, maraschino liquor, and seasonal fruit. I waited with anticipation to see what the seasonal fruit would entail. Wifey wiferson went with the Aviary Chardonnay. Once our drinks were ordered, we were primed to get busy with some food. There was a specials board next to us, but I didn’t find that to be enticing. However, there were a number of items on the regular menu that looked stupendous. It was difficult deciding on just two plates, so we made an agreement to order three on the first round. As we were deciding on those, our drinks arrived. At first glance, I saw oranges buried inside the drink and apple’s on the top. I tried it right away, interrupting my food selection process. I felt a whiskey blast accompanied by only the very slightest fruit aftershock. This was a whiskey drink and a potent one. I like whiskey, so I loved it, but if your not a whiskey drinker, you’ll probably want to consider something else. I made my way back to the food and my wife and I came to a consensus on three items. For starters, we went with the Bread and Butter Pickles with dill, garlic, and sweet onion. We followed that with the Roasted Brussels Sprouts – parsley, cranberry, and walnut – and Crab and Waffles – buckwheat, spicy mayo, and bonito. We waited with great anticipation as we looked casually at the menu for more food to order. After hardly a wink and a nod, our first food item came out. The bread and butter pickles sat in a bowl. I had no doubt I’d like them as I enjoy pretty much any manner of pickle. They appeared fresh and perky which was confirmed by the first bite’s crunch. The cuke and onion combo was mighty tasty. We finished those and the brussels sprouts arrived. The were topped with some crumbled cheese. They were also very good and the cheese took them up a notch. Doesn’t it always? It took a bit after we were done the sprouts for the crab and waffles to come out. I sort of expected lots of waffle and a bit of crab. Fortunately, I was wrong. The waffle was thin and the crab was plentiful. It was topped with a zigzag of sauce and what appeared to be paper thin bacon and maybe flakes of bonito. Regardless of what it actually was, I had to try it. I put a fork-full in my crab and waffle hole and chewed it with my choppers. It was phenomenal. The waffle base, generously applied crab meat, and saucy, flakey accompaniments turned a waffle into a WOWffle! This was serious next-level chef-o-nomics. I was thoroughly impressed. As a side note, if you don’t consume some Maine crab, you are missing out. It’s up there with Maine lobster in its greatness. Basking in the afterglow of crabby magnificence, Mrs. Portlandeater and I had some choices to make. For our next food items, we ordered Roasted Cauliflower – ras el hanout, chickpeas, feta – and Suckling Pig – apple, brown butter, marcona almond. The menu is ordered by lightest on the palate to heaviest. With the suckling, I ordered the very heaviest, but I wasn’t scurred. I needed my pork fix and I hoped that that would suffice. I ordered the small size as they offer both a three and six ounce serving. With our orders in, I contemplated that marcona almonds seem to be the new “in” food. I had only heard of the happy, little nuts late last year and now I see those suckers everywhere. They’re the new chipotle, wasabi, or whatever other food fad has visited us. It’s of no concern though because they are a tasty bunch. With marcona almonds dancing in my head, I engaged in conversation with my lady to pass the time. We discussed bassett hounds, pitching mounds, and making the rounds and before we knew it, we were knee deep in cauliflower. The cauliflower dish was African spiced and came with apple sticks, crispy chickpeas, and other good stuff. It was delightfully delightful. With that, I determined that cauliflower is making a comeback as that’s another food I’ve seen a lot more lately. Some existential thinker might wonder if cauliflower was ever really gone or if we were just ignoring it. Really, I have no idea, but either way, I’m making the official announcement that it’s back and better than ever, baby! Once a few bites of the cauli were consumed, my suckling came out in it’s rectangular, porky glory. Slightly over an inch high and just over 1″ x 2″, it was set in a pool of sauce in which the marconas were drowning. I took the knife I was provided and got down to business. The outer skin was so crispy that I simply couldn’t cut through the meat with a fork. The knife did the job and once I cut through the outside, the inside was moist and tender. I snagged a bite on my fork and ate it up. It was outstanding. The crisp outside and tasty meat were only enhanced by the sauce. The almonds added some extra crunch. It was a really superb dish and definitely susubstantial. Now that we had finished five plates, we debated how many more to order. Just one was the verdict – Spicy Fried Maine Potatoes served with Heintz 57 ketchup. It didn’t take long before the round slices came out. They were perfectly spiced and I was very impressed that so much was done with such a simple plate. Everyone loves taters and these were excellent and a little different than the norm. The completion of the potatoes brought an end to the savory portion of the meal, but we were in talks about dessert. With very little disagreement, we decided to share two desserts and went with sure winners – griddled banana bread – brown butter, frozen maple, pecan – and peanut butter pave – “oreo”, meringue, ganache. I was confident these would make for an insanely delish finish. There was a bit of a wait for the dessert, but nothing excessive. When they finally showed up, I was slightly surprised at the look of the banana bread. I had expected to see the bread with a grey beard and maybe even a well-placed tattoo, but then I remembered that the bread was griddled, not grizzled. Despite my confusion with d’s and z’s, I was ready to dig in. The bread was topped with two large “eggs” of maple whipped cream. I took a bite of the bread, making sure to get plenty of the cream. Upon entry into my mouth, it was like I had hit the proverbial jackpot. The stuff was magical – not overly sweet, but incredibly flavorful, the frozen cream was light and wildly tasty. 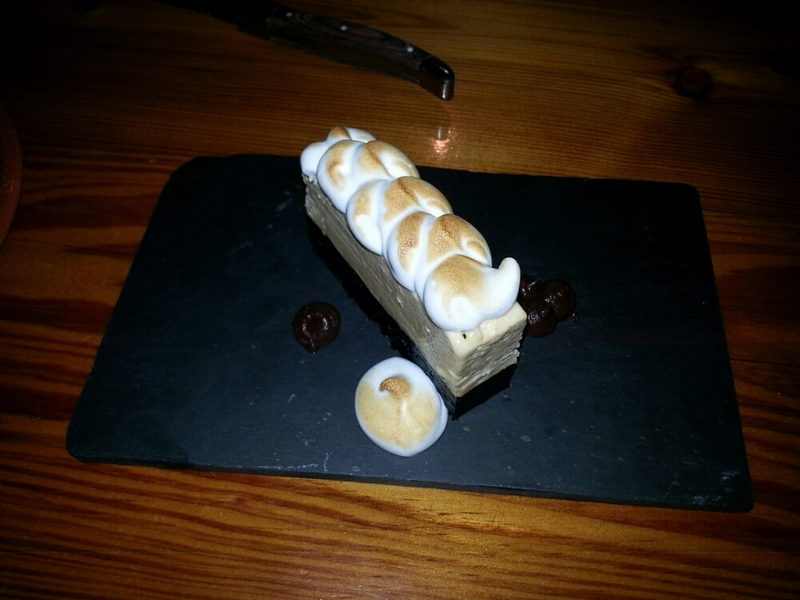 Next up was my peanut butter pave. As I let my wife devour the naner bread, I got ready for my grand finale. Peanut butter is my chocolate and I was more than ready for this jelly…so to speak. With a layer of oreo, peanut butter ganache, and torched meringue, and dallops of meringue and chocolate alongside, it looked phenomenal. I took a bite and it was ridiculously good. The meringue had me doing the merengue and the ganache had panache. The chocolate bottom and peanut butter top had more jazz than a speakeasy. It fit in perfectly with the rest of our food. It was sofa king good. And the end of that brought the end of the food for the night. Many plates were eaten and through they weren’t cheap, Central Provisions truly deserves that James Beard Award nomination. All the plates ranged from very good to truly outstanding. The desserts were utterly impeccable and in line with what I would expect from the great bakeries in the Portland area. If you go and they have the crab and waffles, definitely get that and then go from there. Everything we had led to an absolutely great meal. Even at $116 after tax and tip, it was well with it. We’ll be back for certain. This entry was posted in Portland, ME food on April 16, 2015 by peterpeterportlandeater. Emilitsa is the highest-rated restaurant in Portland on an online restaurant rating site, so it was important for me to get there to see if the hype was real. We had reservations and, after walking around town for a bit, made our way to the Congress St. restaurant for some Greek fare and good times. I was more excited than the Ultimate Warrior running to the ring to try the fabled Congress St. eatery. My first impression of the restaurant as I walked in was that it looked really cool. The bar was on the left immediately as we entered. It was smallish, but really nice and modern. A waitress or hostess greeted us and led us to a table toward the end of the restaurant. It was long and thin with tables along the right side and the aisle to the left. At the end, it opened up to a table for larger parties and beyond that was the kitchen. I sat and began to look at two menus – drink and food. I was impressed by the selection of beer, wine, and liquor, which included both classic and Mediterranean cocktails, but I wasn’t thinking drinks. I was more concerned about food and decided to go dry that night. When the waitress approached, I told her to keep the waters coming and my wife ordered Domaine Skouras chardonnay which came out quickly. At about the same time, we also received a plate of lentil puree with crisp bread courtesy of the chef. Like I had with the drink menu before I decided I was passing, I picked up the food menu to thoroughly investigate my options. After a quick perusal, I saw a number of appetizers that interested me. I considered the scallops in creme sauce or either of the salad offerings, but couldn’t get the Thessaloniki Htipiti out of my head. It consisted of a spread of roasted jalapeno chili with whipped dodoni feta served with grilled pita bread. That seemed pretty delicious to me. When the waitress came for our orders, I chose that and my wife went with Spanikopita – layers of phyllo stuffed with spinach, feta and herbs, rolled into triangles. We decided to wait a bit before ordering the main course. In order to ensure a perfect decision as to what I should order next, I needed a power-up for my brain, so I tried the crispy bread with lentil puree, onions, and whatever other delicious parts from which our gift of food was made. Scoop. Crunch. Whammo! It was awesome. The garlic, onion, and other seasonings made the puree delicious and the crunch gave it attitude. It was a great way to get started. I split my focus between making a decision on more food and eating as much of the food we already had as I could. I was hungry, playa. To keep with a recent theme, my wife focused on vegetarian options for her meal, while I was generally looking for either chicken or fish. 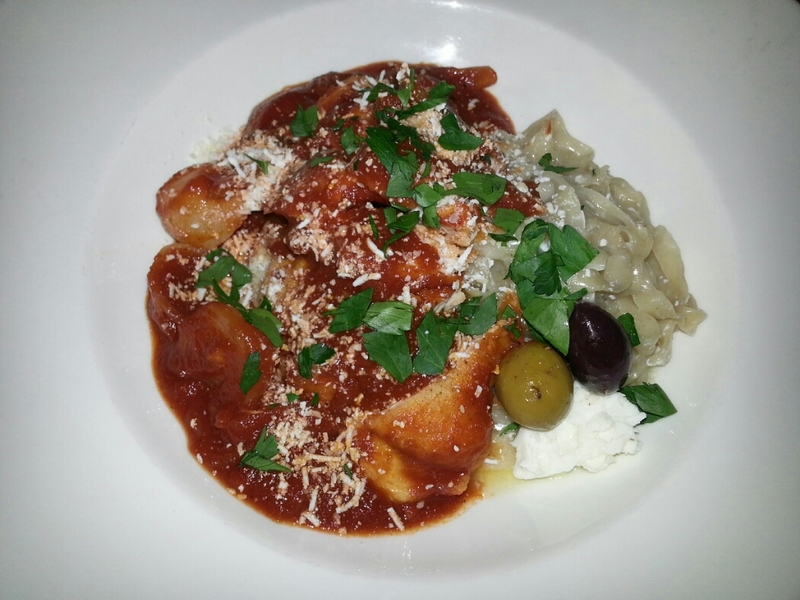 Under the menu category “ellinika trophima anesis” or Greek comfort food, I saw Pastitsatha Zeemareeka – chicken braised in a tomato, baby onion, and cinnamon wine sauce, served on a bed of fresh pasta, with grated mizithra-parmesan cheese. That sounded good to me. I decided I would have that. Mrs. Portlandeater took the vegetarian Bamies Meh Patates – okra and potato braised with extra-virgin olive oil, tomato, garlic, and sweet vidalia onion, crusty bread for mopping, dodoni feta and spiced olives. It was on like Donkey Kong, ping pong, and the Thong Song. Shortly after making our decisions, we received our apps. My wife had two spanikopita – is that the plural for spanikopita? – on a bed of spinach. My plate was covered in a dozen pieces of pita with a bowl of chili cheese spread on the side. I tried a bite of the pita and it was good. I then smeared a copious amount of the cheese spread on the rest of the pita piece and plopped it in my pita piece hole. It was truly awesome. The feta and tempered chili heat made a delicious combo and with more than enough of the spread to go around, I covered my bread with a near-metric-ton of the stuff. My wife loved the simplicity and spinachicity of her spanikopita. We both cleaned our plates of the food and waited for more. As we waited for our entrees, we discussed flux capacitors and their fluxual capacity, but in hardly a handshake and a high jump, the food showed up in all it’s glory. My wife’s just looked like a pile of vegetables in sauce, a piece of bread, and couple olives. Mine honestly looked like an Italian dish with red sauce and pasta though my olives gave a bit of a Greekish feel. I hoped that the Greekness of it would flow through once I got it in my mouth. After watching my wife take a bite of okra and suggest that it was good, I dug into mine. My chicken was cut into pieces, so I cut a piece of that, made sure there was plenty of sauce on it, and drove it home. I instantly felt I had the Greek god of chicken in front of me. The cinnamon powered through the sauce combining with the wine to make a uniquely Greek preparation. It was a food experience that was very different, but different in a really good way. The baby onions were cut in half, golf ball-sized, and were a nice addition to the plate. I had to try the pasta next. It was all stuck together in a pile, which is actually how I like it. I feel that sticky consistency delivers a perfect texture. I gathered several strands, ran it through the sauce, and gobbled it up. It was incredible – doughy, fresh, and absolutely delicious. I was on cloud ten…nine was being rented – presumably by someone else at the restaurant. We finished our meals and debated whether or not to order dessert. While I wasn’t overly hungry, I knew I could make room for the right bite. The options on the menu were cheesecake, custard, and baklava. After narrowing it down to the first and the last, we settled on Baklava – phyllo, walnut, cinnamon, honey – to share. It’s one of my all time favorites and this one came with a dallop of whipped cream and some sort of honey brittle. It was utterly delicious and exactly what I expected. We finished it, my wife had a coffee, and we were done. Even though we didn’t have drinks other than one wine, it wasn’t a cheap meal. After tax and tip, it all came to $116. Emilitsa was awesome but pricey. It’s going into the rotation though, and maybe next time we’ll land a seat at the bar. That sounds like a solid plan. Until then, I will revel in the glorious gift of Greek gastronomic greatness that Emilitsa brings to Portland. You should go too, because I’m telling you to. If you don’t, you’ll be plagued by tarantulas in your bed at night. This entry was posted in Portland, ME food on April 9, 2015 by peterpeterportlandeater.